2018 has been a landmark year for the crew at Control Jiu Jitsu. 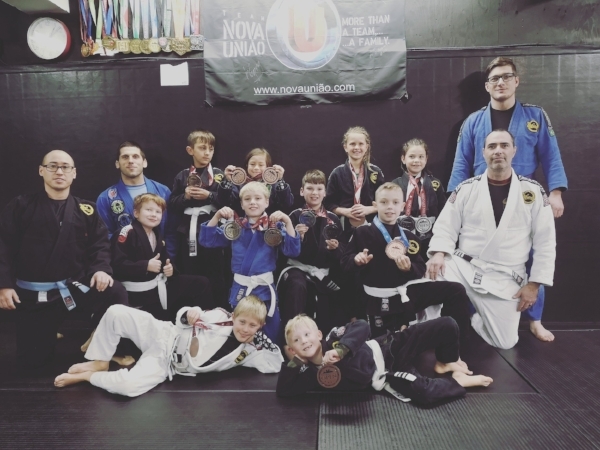 They won some gold medals in the summer, then moved to a new location, then saw membership numbers jump massively, then they won a bunch more gold medals and now, to top it all off, Control Jiu Jitsu will be hosting the Provincial Championships at the Yara Centre on Saturday November 10th. "Once we found out that SaskBJJ was looking for someone to host provincials this year we immediately volunteered to bring the event to Moose Jaw" said Coach Donald Booth. It worked. The SaskBJJ Provincial Championships will take place at Yara Centre on Saturday November 10th. The fights start at 9:00am and run long into the afternoon. Kids as young as five all the way up to a Master Class for adults 30 and up will be competing. "This will be the first Brazilian Jiu Jitsu tournament held in Moose Jaw" said Coach Donald Booth. That's a nice milestone for Control Jiu Jitsu and the state of Jiu Jitsu in the Friendly City. But according to Coach Jason Church this is just one more small step toward making Moose Jaw a home for Jiu Jitsu. "Moose Jaw will be a Jiu Jitsu city" He stated emphatically. Coaches Donald Booth and Jason Church (On the left) and the kids who competed at the Queen City Open. Control has had some success on the Provincial level, two of their youth students won Gold at this year's CopaSask in Regina and another two did the same at the Queen City Open in October. But Coach Church sees this as simply the beginning of something bigger. "We strive to be competitive in the Saskatchewan/Canada/World Jiu Jitsu scene, so we will always look to do better" he said. "We have been smiling through the whole process as we get bigger and better. We see the love of the sport growing so we know we are doing something right" he added. "We expect all of our students to do well this time around" said Coach Booth. "We’ve made some adjustments to their game and we are expecting to see several golds come home with us." "This event will be fun for spectators because it will showcase all of the hard work each one of our students have put in. The crowd tends to get pretty into the action so I know it’s going to be a good time" said Coach Booth. "Nothing is more special than having Grandma/Grandpa there cheering them on" said Coach Church. Coach Booth says he knew that Jiu Jitsu would take off in Moose Jaw "but we had no idea it was going to catch on this quickly." Word spread and classes got bigger. "We put our hearts and souls into what we do so others picked up on it and are now sharing our passion with us." The club now has around 100 active members and they are growing each month. "Our kids program is the largest we’ve ever had, with over 40 active students" said Coach Booth, adding that "adult membership fluctuates but we regularly hold classes with over 30 students." Growing popularity may be a pretty great problem to have, but it can be a problem nonetheless. Coach Church said that the new gym (710 Main St., in the basement of Dirk Fitness) was definitely helpful in accommodating the Jiu Jitsu-craving hordes, but admitted it's still not enough. "We already need more space. We see the growth of our sport in the city and have a million ideas to expand and take over Moose Jaw." The coaches have received lots of help from other other coaches and athletes. At any youth class you can see as many as six people helping guide the students through their tasks. It's all part of a continual evolution said Coach Church. "We will never be stagnant. We have more help from other coaches/athletes so that allowed us more sparring time. We always look at what is working, what we need to change and what others are doing. "If the numbers continue to rise we plan to offer additional programming to meet the demand" said Coach Booth. After the provincials, the next plan, Coach Church says is to compete in some world level tournaments and then look at hosting a submission only tournament.